Latest News: We're now a Licensed Dealer! Check out our inventory here. Also, Brian Kane featured in Popular Mechanics Magazine! Click here for the shoutout! ​The wellness of your vehicle is important to us because your safety on the road matters. That's why we consider ourselves The Primary Care Provider for all your automotive needs. ​We'll always tell you what needs attention right away, and what can wait to repair down the road. 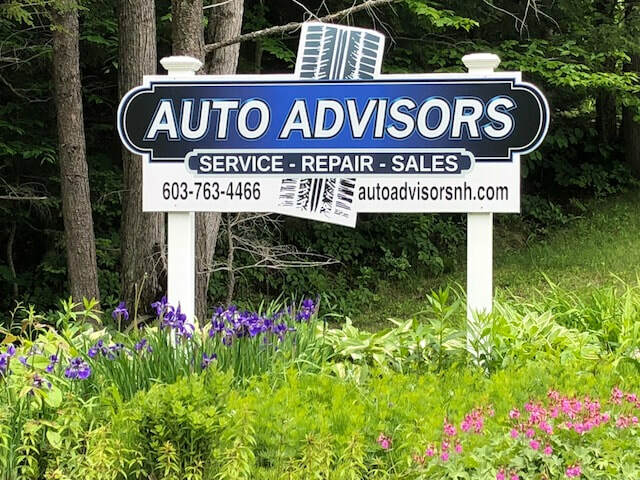 Monday- Thursday: 8 a.m.- 5 p.m.
Auto Advisors is a full service automotive maintenance and repair facility located in the Kearsarge - Dartmouth/Lake Sunapee Region. We service both foreign and domestic cars, and light to mid-duty trucks in the New London, Springfield, Sunapee, Grantham, Wilmot, Newbury and surrounding areas. Our team is ASE Certified (Automotive Service Excellence), dedicated to quality work and professional service. Whether you trade cars every few years or keep them running into their golden years, our service is done with critical thinking and attention to detail to keep your vehicle healthy... and to keep you and your family safe on the road.﻿﻿ Learn more about us here! ​offering quality parts with a 2 year, 24,000 Mile Warranty. Auto Advisors sign on Georges Mills Road. We love summer time blooms! We are easily accessed from I89, just off exit 12-A. - From the South, take a right off of the exit on to Georges Mills Road. - From the North, take a left off the exit onto Georges Mills Road. ​- We are approximately ¾ mile on the right. Learning how to jump start a car at the Women's Car Care Clinic. As members of the Lake Sunapee Area Chamber of Commerce, we are committed to giving back to our community. We are proud to run The Pantry Project, providing service discounts for nonperishable food items brought to your appointment, which are donated to the Kearsarge Lake Sunapee Community Food Pantry. We also host lively car care clinics for women and new drivers, reviewing the basics of fluid checks, jump starting a battery, changing a tire, and more! keeping you and your family safe on the road.